Federal contractors or subcontractors must comply with many affirmative action obligations surrounding applicant management, job postings, career site statements, and outreach effort evaluations, to name just a few. 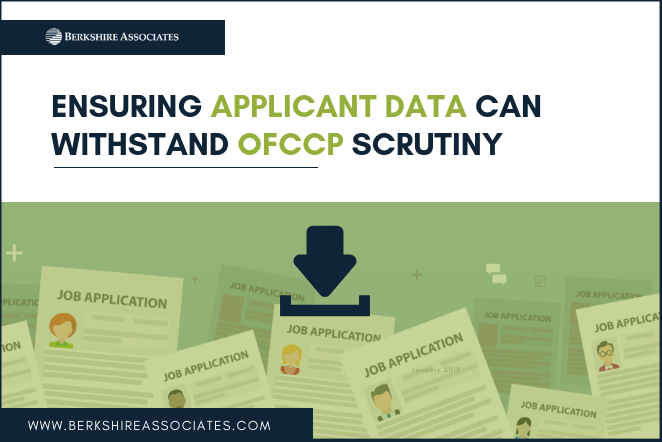 This blog will guide you in putting together robust applicant data for your affirmative action plan so it will be more likely to withstand OFCCP scrutiny in an audit. Date range—Applicant data is the only affirmative action plan data set that is generated based on a requisition fill date rather than the prior 12 months from the plan date. All external requisitions that were filled during the plan year should be included. Do not include requisitions with only an internal placement, cancelled requisitions, requisitions on hold, or requisitions that are still open. New hires—If possible, include the requisition number in the new hire file. This helps to narrow the applicant data included to only those applicants who were considered for the hires in the plan. Temporary to regular conversions data points—If you are an employer who sometimes fills positions doing temporary to permanent conversions, we recommend setting up a requisition system with the temp agency and periodically collect the data points mentioned in the previous bullet from them. Affirmative action obligations surrounding applicant management and job postings are not suspended for employee conversions from temporary to regular. Instead of retroactively seeking data from the temp agency to include in your applicant log, consider proactively collecting the necessary data. Data management techniques—Ensure you have documentation of all data management techniques used to manage your applicant pools, for all requisitions. Quality checks—Always have your new hire data handy. Verify each new hire has a corresponding applicant pool. Remove data associated with requisitions that do not have a corresponding new hire record. Investigate any areas of 1:1s—where one applicant applied for the job, and the applicant was hired—in those cases, see if any additional applicant data is available. Verify that self-ID information (race, gender, disability, and Veteran) between new hire and applicant record for the same individual match. Check to see if you have applicants with application dates beyond the hire date noted on the requisition. This might indicate evergreen or open requisitions were not closed in a timely manner. Run a check on the use of disposition codes. If you find the majority of applicants are coded to one disposition code, or if everyone who was not hired is “not best qualified,” consider revisiting the codes available and training recruiters on the codes available. Once these kinks have been addressed, your data is ready for further analysis. This will also put you in a good starting place in case of an OFCCP audit. Berkshire’s consultants can work with you on applicant data to ensure the correct records are included. We can also assist you with other affirmative action compliance services. Please contact us at bai@berkshireassociates.com or 800.882.8904.